With the rain and sunshine in the forecast, allergies are bound to begin to bother people again. Pressure behind the eyes and in the cheeks, watery eyes, runny or stuffy nose, and headaches. We have some tips and tricks to help those of you who may suffer each change of the season. Get a chiropractic adjustment! This aids in boosting your immune system and balancing your body better. Plus, did you know we can work on sinus congestion, head stuffiness, and even add acupuncture for those stubborn sinuses?! Many get great relief from acupuncture specifically focused on the sinuses and head. Lavender and Peppermint essential oils may be beneficial topically or in a diffuser for your allergy discomforts. Many patients put these two oils together in a handy roll on bottle for easy application to keep it on-the-go. We also recommend liver supporting teas and tinctures. Roobios tea, green tea, licorice root, dandelion root…among many others! You may see formulas from the likes of Traditional Medicinals for Liver Detox or Breathe Ease that have some of these in them. Drinking 2-3 cups per day warm or cold may be very beneficial. Dietarily you may also want to avoid high-histamine type foods. Foods such as tomatoes, spinach, eggplant, dairy, fermented veggies and breads, and alcohol may make your allergy symptoms worse. Try your best to eliminate or avoid these food types of you are having symptoms. We have nutritional formulas for adults and children for natural allergy relief. Capsules and chewable forms. Professional grade formulas not to leave you drowsy. 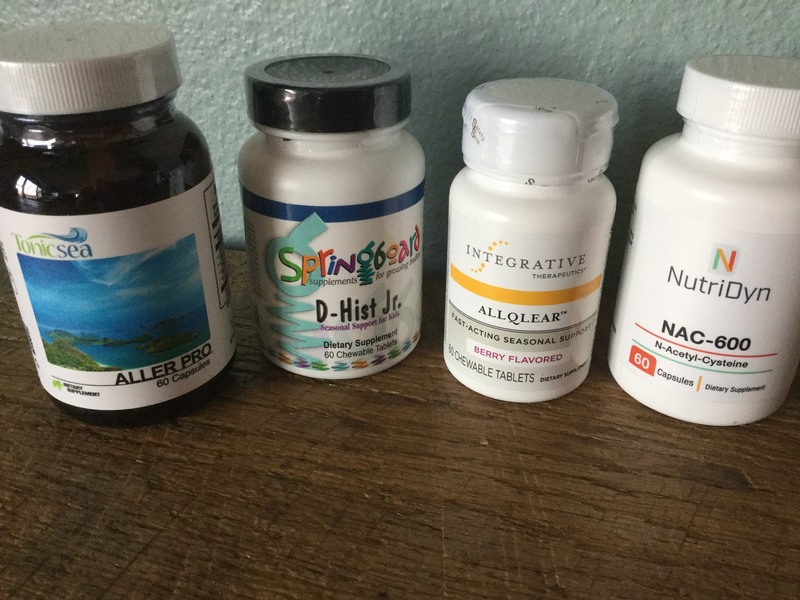 The following formulas have an anti-histamine affect: Aller Pro, D-Hist and D-Hist Jr., AllQlear, and NAC-600. We have other immune support options too, but these are a few for allergy symptoms in particular. Call or email us if you have particular questions on dosing or how these may help you, or if you are already experiencing allergy symptoms and need some chiropractic, acupuncture or massage work done! We look forward to enjoying the sunshine and nicer weather like many of you! ← Great News from NutriDyn!